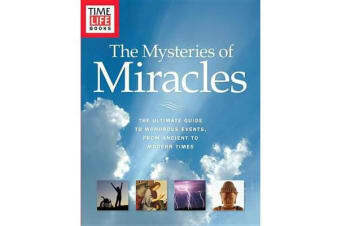 Miracles are among the most enduring mysteries of time, elusive proof to believers of the existence of a higher power. Yet even as such events have dazzled and engaged the faithful for thousands of years, they have also prompted impassioned debate. As far back as the 12th century, religious figures like St. Francis of Assisi have inexplicably been afflicted with Jesus’s crucifixion wounds, while today, statues and other likenesses of Jesus are routinely reported as appearing to weep or bleed. But miracles are not restricted to religious accounts. Modern life and medicine are full of miracles, from the New York window washer who fell 47 floors, lapsed into a coma, and then awoke, to the paraplegic who regained his ability to walk after being bitten by a spider. With full color images throughout, TIME-LIFE Mysteries of Miracles explores history’s most famous miracles, their enduring appeal, modern miracles, and just how much science can truly explain— or not. For any person of faith or anyone fascinated by unexplained phenomena, this beautifully illustrated guide will intrigue and surprise you.